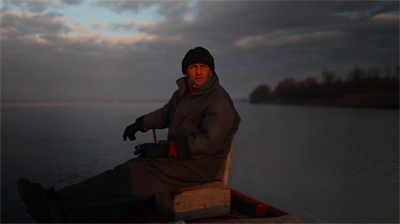 A different approach of telling a story through documentaries has been introduced by Ukrainian director Oleksandr Techynski by his 2018’s 81-minute film; ‘Delta’. The film has been screened at the Ismailia Cultural Palace Friday as part of the 21st edition of the Ismailia International Film Festival for Documentaries and Shorts, taking place between 10 and 16 April. 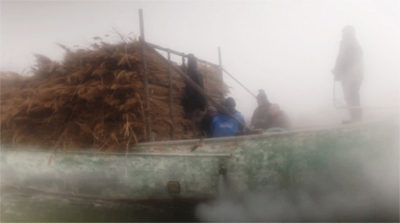 A foggy picture dominated the most of the long-duration scenes, no use of narration or interviews or even music, but still; the story of the people of Danube Delta in the Bukovina region has been told efficiently. “It’s a very nice place I saw ten years before I decided to make a documentary about it. I went there in two successive winters and that was enough. The picture you saw in the film is almost 75% of the material I recorded,” the 40-year-old cinematographer told Ahram Online after the screening. Mostly known for his co-directing of ‘of All Things Ablaze’ (2014), Techynski has received remarks about his long-duration shots; many critics agreed that his picture is artistically picture. “About the foggy picture; this is how our winter looks like. I don’t agree that my scenes are long. I am a man who has no questions, that is why I didn’t interview or narrate,” he defended his technique during a symposium held after the screening apologizing about some instability in some scenes and some random focuses of his camera. Scenes, filmed with only one camera, provides artistic pictures with the rich soundtrack full of texture and atmosphere, are for the people of the north-eastern Romania and western Ukraine forgotten city doing their main activities; wheat agriculture, fishing, making liquor, drinking and most of the time smoking and cursing. “I am still young and learning. I hope in the future I produce a film that fulfills your standards,” Techynski responded to Egyptian known film critic Magda Morris after her remarks during the talk. Under helms of critic Essam Zakariya, lots of different activities are being held at the 21st edition of the festival, attended by tens of filmmakers and critics from across the globe, with dozens of film competing in the various categories while many others are being screened through parallel programs celebrating African, French and Polish cinemas in addition to honoring seven filmmakers and screening their work.